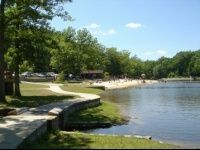 Compete list of State parks in PA.
One of the Most Relaxing Pennsylvania State Parks! Visit this small park in central Pennsylvania located on the banks of the Susquehanna River. Once a prime logging route, this river now is host to scores of waterfowl and fish. Great for boating and fishing, this picturesque recreational area is sure to please. During your visit, be sure to set aside time to ride the historic Hiawatha paddle wheel riverboat, located in the heart of the park. This re-creation of an 1800s riverboat has been plying the Susquehanna for more than 30 years and is available for public rides 6 days a week - closed Monday. Fun Year Round at Ryerson! Spectacular Summer outings! 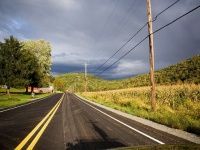 Hike over 13 miles of trails, picnic at one of the many pavilions and make use of the charcoal grilles, and swim in the free pool - great ways to spend a day with the family in Pennsylvania. Camping is available year round and some electrical hookups are available for a fee. Wonderful for winter activities! Ryerson has sledding hills, cross country skiing, an ice skating area and 6 miles of snowmobile trails! Located on the West Virginia border, this park is easily accessible to all and a great place to spend time outdoors. In Visitors, this Tops the List of State Parks in PA! One of the largest parks in Pennsylvania, this is an incredibly popular stop for hundreds of thousands of visitors each year. The 17,088-acre Pymatuning Reservoir has four swimming beaches, many boat launches, boat rentals, a fish hatchery and countless wildlife. A preferred Pennsylvania fishing spot, fishing enthusiasts can catch bluegill, bass, crappie, perch, carp and walleye among others. Many camping options also make this mammoth park a fantastic place to visit. Choose from tent camping with amenities such as warm water and flush toilets, or rent one of the twenty modern cabins that come with furnished rooms, a kitchen, and 2 or 3 bedrooms. Snowfall turns this outdoor Eden into a winter wonderland. Visit to go sledding, snowmobiling, ice fishing, ice boating, and cross country skiing in PA.
For those interested in getting away from it all, numerous hiking trails take visitors through natural habitats of many wild animals. Undeveloped Clark Island and the 725-acre Blackjack Swamp have unique ecosystems and are home to many species of trees and wildlife. Located high atop the Allegheny Front, Black Moshannon State Park is an ideal place for wildlife observation in a variety of habitats. The park is named for the dark, almost black waters of the Moshannon lake, colored by a unique mixture of bog plants and vegetation. Hundreds of picnic tables and a refreshment area make this a good place to bring family or friends to spend an afternoon outdoors. More than 13 trails take hikers through the park's forests and bogs where they can observe the beauty of nature. The park's bogs are home to many species of orchids, all three of Pennsylvania's carnivorous plants, and scores of amphibians, waterfowl and beavers. Open year round with plenty of snow-based activities in the winter and cabins for rent, this is a perfect place for PA state parks camping. Beautiful Park in Western Pennsylvania! Located on the Youghiogheny River (a tributary of the Mississippi River) Ohiopyle State Park is a wonderland of natural beauty. View some of the many natural waterfalls scattered throughout the park, watch the wildlife undisturbed by modern man, or float lazily down the creek enjoying the natural water slides formed by the flowing water. 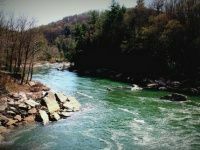 For the more adventurous minded Ohiopyle has rapids for whitewater boating, numerous areas for rock climbing, and hiking trails of varying difficulty. Spend the day and picnic in this peaceful park with your family, or spend time under the night sky at Kentuck Campground which has warm water and flush toilets. For a change of pace cycle the Great Allegheny Passage to a nearby trail town. A perfect place to relax year round, Ohiopyle also has sledding areas, cross-country skiing, and snowmobiling when the snow falls. Great Park with History, Scenery, Wildlife and more! 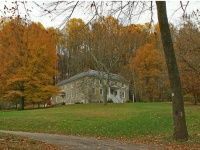 Originally sold to William Penn in the late 1600s by a Lenni Lenape chief, this preserve has a long history, and many old buildings can be found in the park. 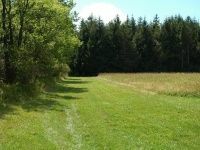 Hike, Bike, or ride horses over the 8 miles of equestrian trails in this 2,072 acre Pennsylvania preserve. Fishing and hunting are also available at the park. With about 1,800 acres open for deer hunting (the only type of hunting permitted at the preserve) this is a great place to come in season. White Clay Creek is stocked several times a year and is great for trout fishing. White Clay Creek has superior historical, recreational, wildlife, and scenic value, it has been designated by Congress as a National Wild and Scenic River. This will preserve it, unchanged, for generations to come. 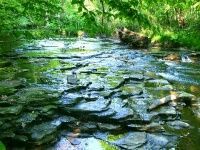 This preserve shares its boundary with White Clay Creek State Park in Delaware, so why not make a day of it and visit both? One of the Most Stunning State Parks PA has to Offer! Once the site of a prosperous lumbering town in the late 1800s, Poe's Paddy State Park lies on the convergence of Big Poe Creek and Penns Creek. The park is named for nearby Poe Mountain to the west and Paddy Mountain to the east and is home to gorgeous scenery. Ideal for trout fishing in Pennsylvania, Penns Creek is also home to spectacular fly hatches during the spring. 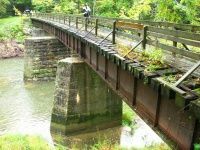 Pack a picnic lunch and hike the Mid State Trail - be sure to go through the exciting 250 foot long Paddy Mountain Railroad Tunnel. The camp ground is open from April to October and offers drinking water and rustic toilets. This park also offers outdoor education for young people. Check out the PA state park visiting information for details about their "Exploring Careers Outdoors" camp for high school aged young people. 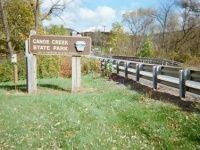 High on the List of State Parks in PA! Set in the side of the Locust Mountain, this park offers a variety of natural ecosystems - forest, mountain, wetland and lake. Fifty-two acre Locust Lake, located in the heart of the park is a great place for fishing, swimming, and boating. Row boats, paddle boats, and motor boats are all welcome on the lake. 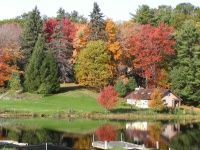 Fish for trout, bass, panfish and pickerel in this warm-water fishery. Take a break and go for a swim, then grab a snack at the camp store! In the winter Locust Lake is great for ice-skating and ice-fishing! Campers can look forward to flush toilets, warm-water showers, and some electrical hook-ups. Pets are allowed at designated campsites and both tents and trailers are welcome. 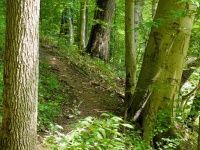 Hike or bike several miles of trails and enjoy this scenic Pennsylvania state parks many natural beauties. A Park with Something for Everyone! Beautiful in all seasons, come see the awe-inspiring view at Lyman Run State Park located near Pennsylvania's northern border. A great place to enjoy outdoor recreation in comfort, this park offers a host of amenities. With a sand beach swimming area that comes with flush toilets, changing rooms, a snack bar, and boat rental - nothing is left to be desired. Campgrounds have flush toilets, warm showers, and electrical hookups while picnic areas offer charcoal grilles, drinking water and a play area. A perfect park for the whole family. For explorers - Lyman Run hosts a special adventure for geocaching enthusiasts. Collect cards from all 30 of their outdoor geocaching sites and receive a special coin. For adventurers - From Lyman Run State Park, over 43 miles of ATV trail in Susquehannock State Forest can be accessed. A Peaceful PA State Park Packed with Wildlife! Whipple Dam State Park is a fantastic place for water based recreation. The 22-acre lake is stocked with trout several times a year, making it a great fishing spot. The park's boat rental offers man-powered boats such as canoes, kayaks and paddle boats, while private electric-powered motorboats are also welcome. Charcoal grilles, drinking fountains and restrooms located throughout the picnic areas make this a great place to come and spend the day. Hunting is available in some areas of the park, with deer, bear and several types of fowl being the most common game. Many unique photo opportunities are available for photographers who wish to capture images of wildlife in their natural habitats. This Eastern PA Conservation Area Embodies Peace. 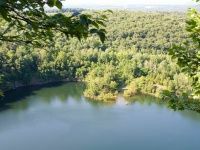 Designed as a place to preserve nature untouched by human hand, this conservation area serves as a retreat for Wayne County residents and wildlife alike. With little development and no through-roads this space is prefect for wildlife photography, birdwatching, and passive observation of nature. 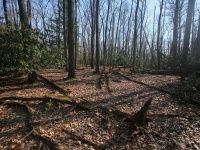 Several miles of trails take visitors through various tree species including hemlock, ash, red maple and many northern hardwoods - beautiful hiking in Pennsylvania. As a conservation area, many activities are prohibited, including biking, horseback riding, and the use of motorized equipment - so be sure to pack your hiking boots and get ready to spend a peaceful relaxing day in the wild. Fun for All at this DCNR PA State Park! Scenic Shawnee State Park - named after the Shawnee Indian tribe - is a paradise of natural beauty. Swimming is available from May to September and has modern bathhouses with flush toilets and showers. Vending machines offer cold drinks and snacks or you can bring your own and enjoy one of the many picnic areas. For something different, try disc golfing at the 9-hole General Forbes’s Challenge course. Hunters will find deer, squirrels and grouse among other game. 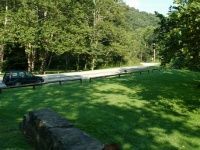 For visitors interested in PA state parks camping, Shawnee offers tent camping, cottages and yurts for rent, or for large groups the two story Shawnee Lodge offers a perfect group camping experience. With 16 miles of hiking trails and over 7 miles of biking trails this state park in PA is sure to keep visitors busy enjoying themselves! PA Woodland and Prairie at this Great State Park! The only public protected prairie in Pennsylvania this park has a one-of-a-kind mix of prairie and forest. Many educational programs are offered at Jennings for both children and adults to raise awareness and increase knowledge of the importance of our natural resources. Check out the PA state park visiting information for the events schedule. Jennings is open year round, but visitors are recommended to come in late July or early August when the prairie is in full bloom. Especially of note is the beautiful purple Blazing Star flower which, along with many other flower species, can be seen to best advantage by hiking one of the two prairie trails. More than 10 woodland trails of varying difficulties take visitors through the rest of the park. One of the Best State Parks near Philadelphia! Open year round, this state park located near Philadelphia is an ideal place for a day trip. For explorers, 35 miles of hiking trails run throughout the park over various types of terrain and past spectacular views of natural beauty. A paved bike trail and 14 miles of horseback riding trails are available for those who like to enjoy nature at a faster pace. 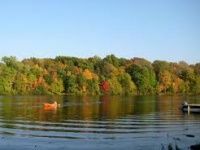 A popular place to go windsurfing and boating, boat rentals are available for those who wish to navigate on the 1,450-acre Lake Nockamixon. This warm-water fishery will please fishing enthusiasts who can catch walleye, muskellunge, pickerel, small mouth and large mouth bass, striped bass hybrids, channel catfish, carp and various types of panfish. 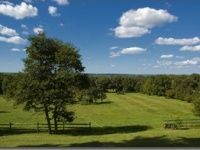 Hunting, trapping, and the training of hunting dogs during certain seasons is available on nearly 3500 acres. Great Pennsylvania State Park for Families! Located next to state game lands, this wilderness is replete with wildlife and the beauty of nature. Boating, hiking, and backpacking are available year-round. A fun place for PA camping, Chapman State Park has flush toilets, electric hookups and warm-water showers for campers, along with several sleeping options (yurts, cottages, tents and more!) For family fun, guided walks and educational programs are available to increase your environmental knowledge and appreciation. Chapman State Park is a great place to go in the winter for snow sports and activities. Navigate over 4 miles of ski trails adjacent to a national forest; sled down the 7 acre slope; go ice fishing on Chapman Lake, or ice-skating in designated areas on the lake. When you need a break to warm up, step into the park's Warming Hut with a wood burning stove and benches. 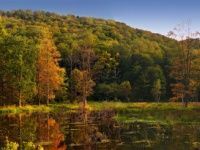 PA State Parks have Wetlands, Fields and Woodlands! Hiking, swimming, boating, fishing, camping and horseback riding are just a few of the activities available at this beautiful state park. For a break from normal park activities try out the 9-hole disc golfing course. Educational programs are offered year round to help visitors build a deeper understanding of wildlife and the habitats in which they live. Home of the Frank Felbaum Bat Sanctuary - one of the largest colonies of brown bats in Pennsylvania - on Summer evenings visitors can attend programs to learn about these little creatures and watch the awe-inspiring exit of thousands of bats from their home in the limestone mine. Unique Among PA State Parks! 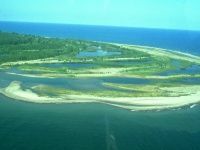 Due to the size, surf and sea-like properties of Lake Erie on which it is located, Presque Isle State Park is known as Pennsylvania's only "seashore." Open to boating, swimming, recreational SCUBA diving, and water skiing, this is truly the most versatile of PA's state parks when it comes to water sports. Take a scenic boat tour or climb the 75-foot observation tower and see things from a new perspective. To see a myriad of wildlife and natural beauty, take Pontoon boat rides through the interior of the peninsula. Kayaking through the lagoons at a leisurely pace is another great way to view nature. 11 miles of trails skirt the beautiful lake, and picnic facilities are available in various locations. Presque Isle State Park closes in the evening, but overnight accommodations are available nearby for those who wish to make a longer stay. For a beautiful day out of doors visit World's End State Park. Set in a narrow valley on the Allegheny High Plateau this park has stunning scenery and a wide array of wildlife. Perfect for outdoor activities such as hiking (with over 20 miles of trails! ), birdwatching (over 200 varieties of birds! ), swimming and whitewater boating. Open year round this is a great place for camping and picnicking in the Summer, or cross-country skiing in the Winter. World's End State Park offers cabins, warm running water and flush toilets for campers. This One Stands out Among the State Parks of PA! 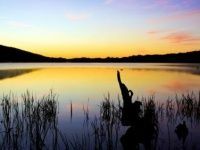 A great state park to go to with the family, this scenic park features towering trees, a huge variety of wildlife, and picturesque trails. Canoeing in the Clarion River, biking through Toms Run Valley, horseback riding, and hiking along the park's 30 miles of trails are just a few of the adventurous activities in this huge park.Cook Forest State Park offers plenty of opportunities for photographers, so be sure to bring your camera along! A craft center and theater housed in a historic sawmill provides an indoor diversion for visitors. Environmental Education classes are also offered to help teach youngsters about the importance of preserving nature. A Natural Wonderland of Pennsylvania Flora and Fauna! French Creek State Park is a haven from the hustle and bustle of urban life for people and wildlife alike. Retreat to this 7,730 acre park that is home to a variety of habitats including fields, lakes, wetlands and forests. Full of animals such as deer, squirrels, raccoons, and a variety of birds, The National Audubon Society has designated this park as Important Bird Area and Important Mammal Area. Come spend a day picnicking and swimming - or stay longer and camp out as you enjoy the gorgeous scenery. French Creek offers flush toilets and warm running water for campers. You can bring your own tent or camp in this PA state parks cabins, cottages or yurts! 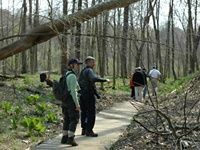 Choose from 10 hiking trails, or explore on your own as French Creek State Park is a favorite spot for orienteering.